Using the best dividend payers can help you retire stress-free. Bond yields are not enough for the majority of people who want to retire. There is a better way. Dividend champions are less volatile than the overall stock market, which increases your chances of retirement success. Running out of money in retirement is a dreaded fear by so many of us. In fact, more people fear running out of money than they do of dying. 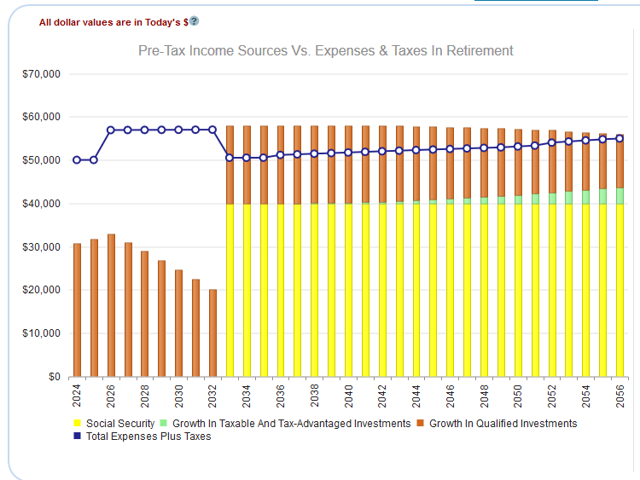 One major reason for all of this stress is that people's expenses in retirement exceed their after-tax income. This can happen across all wealth spectrums too. I have seen couples with $2 million that didn't realize that their income won't cover their expenses once they retire. This means they are dipping into principal, and at that point it's just a race against the clock as their investment balances dwindle over time. When bond yields were higher a decade ago, planning for retirement was so much easier. A ten Treasury yield of 6.5% vs. today's 2.9% makes an enormous difference over time. 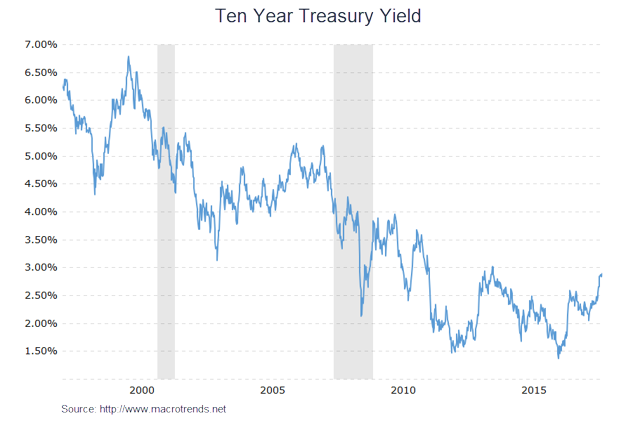 If a person has $1 million invested solely in Treasuries, over 20 years this difference in yield (in a tax-deferred retirement account) means a difference of over $1 million! No wonder so many people are struggling to fund their retirement these days. It also doesn't help that we cannot plan on Social Security being there for us. It's bad enough that bond yields have fallen by half, but now financial advisors are telling us to cut our projected Social Security by 25% to 50%. It might seem there is no way out of this conundrum. Many people are simply cutting expenses to the bare minimum in retirement and hoping their Social Security benefits aren't cut. But hoping isn't a good strategy. A good strategy, in my opinion, is finding the best dividend-growth stocks on the market, investing in them early, and living off these dividends in retirement. With the stock market doing so well over the past several years, it's easy to forget how important dividends are to the overall total return of equity investments. 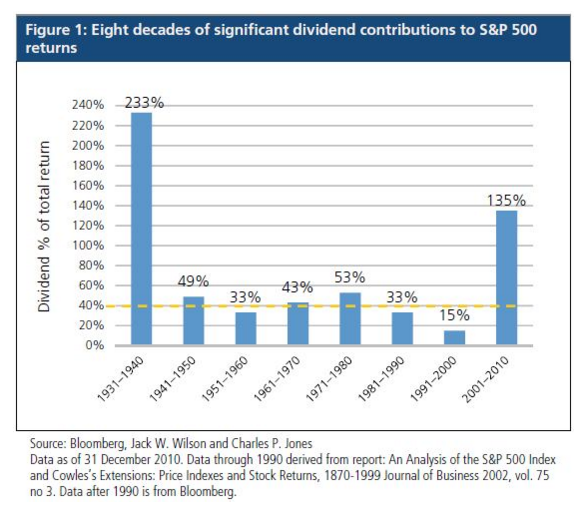 But as you can see in the chart below, dividends have been responsible for at least 30% of the S&P 500's overall return in seven decades out of the last eight. Using our publicly available planning software, I looked at a couple that wants to use retirement income to pay expenses of $55,000 per year. They are both 50 years old today and they have $400,000 saved. They are planning to retire at age 64. Half of their money is in an S&P 500 index fund and the other half is in Treasury bonds. As you can see below, their income will not cover their expenses in retirement. 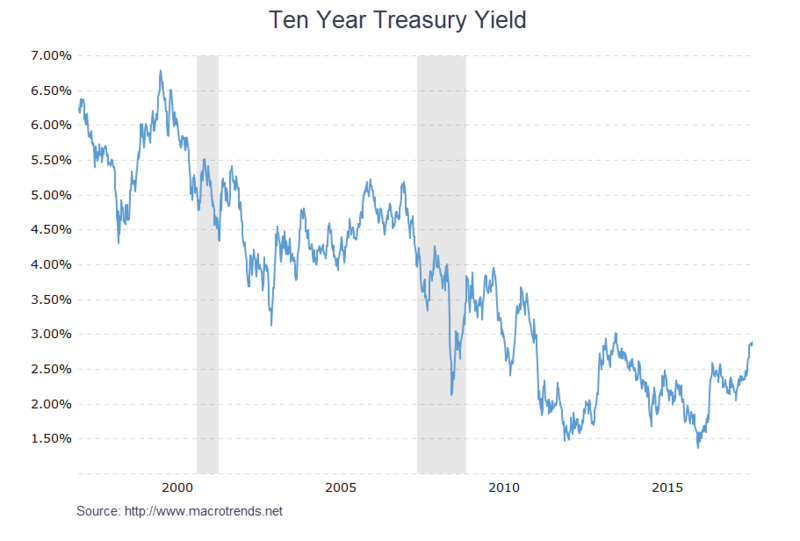 It's no surprise that they cannot pay for their expenses each year since half of their money is in Treasuries, with a yield that barely covers inflation. But what if we move all of their Treasury money into solid dividend payers? I'm not just talking about any dividend payers. I am talking about a diversified portfolio of at least 15 of the best dividend champions out there; companies such as Altria (NYSE:MO), Exxon (NYSE:XOM), Walmart (NYSE:WMT), and Procter & Gamble (NYSE:PG). These companies have shown they can increase their dividends every year and have not cut their dividends, even during recessions. 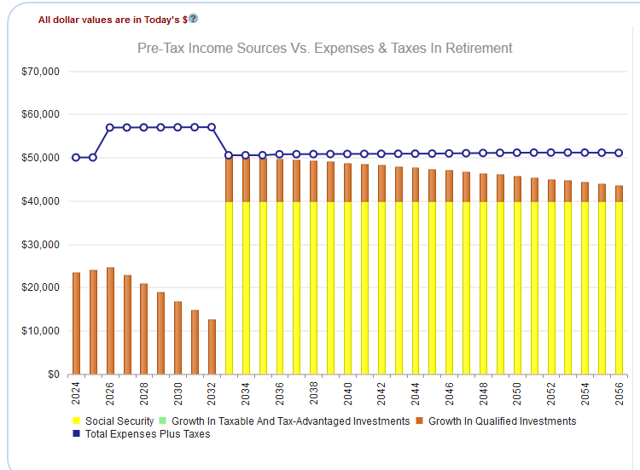 You can see that once their Social Security benefits kick in, their after-tax income now covers their expenses every single year in retirement. Now, I can hear many people saying "But that doesn't take into account the added risk of stocks!" You would be right to say that. This is why we also need to look at their overall probability of success using Monte Carlo analysis. Besides their ability to produce growing income over time, the best dividend champions can also reduce your overall portfolio volatility relative to other stocks. 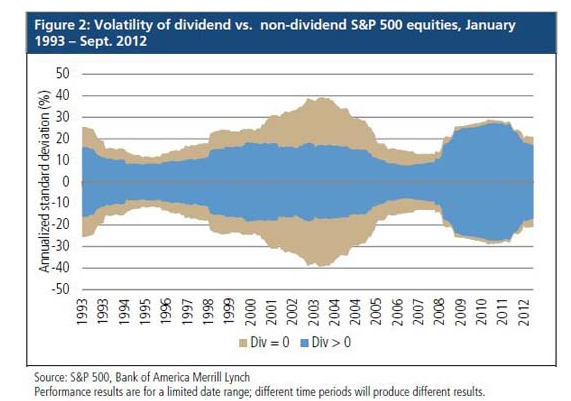 The chart above shows that over time dividend payers have less volatile returns than non-dividend payers. This is key to increasing one's chances of not running out of money in retirement. Volatility is a very important input into Monte Carlo analysis for retirement planning. Generally, the more volatile the portfolio, the lower the chances become for never running out of money. Monte Carlo analysis runs thousands of scenarios where portfolio returns move up and down based on historical volatility and correlations among asset classes. 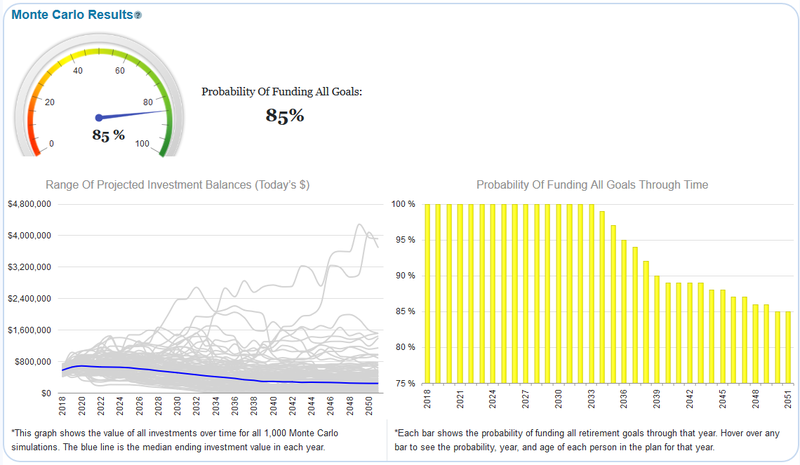 I ran Monte Carlo analysis for this couple and I found that with their original portfolio, their probability of never running out of money in retirement was only 45%. But once we move them to our basket of solid dividend champions, their probability of not running out of money jumps all the way up to 85%! Another benefit of owning dividend stocks in retirement is that many of these companies increase their dividends over time, helping offset the effects of inflation. According to the Wall Street Journal, the S&P 500 has seen dividends grow by 5.7% over the past 50 years. This easily covers 4% inflation over that same time period. One caveat to this strategy is to be careful when buying mutual funds or ETFs. Their fees can completely offset the gains from using dividend payers. Make sure you are finding the lowest fee funds if you are going to use funds instead of individual stocks. Vanguard is always my favorite place to start. Their selection of ETFs is incredible and it's tough to find less expensive funds out there today. Disclosure: I am/we are long XOM, MO. I wrote this article myself, and it expresses my own opinions. I am not receiving compensation for it (other than from Seeking Alpha). I have no business relationship with any company whose stock is mentioned in this article.